Currently, I have been working for training and research section of Bangladesh Open University Bangladesh Open University as Deputy Director (Training). Usually, I coordinate training and workshop programme which are usually funded by BOU or by Foreign organizations like Commonwealth of Learning,UNESCO and other local and foreign organizations. I am responsible for maintaining international communication. My desk is a full-fledged international desk. Thus, I usually work those issues that involve international policy and decision. I am also responsible for looking after study leave and duty leave for higher studies, training, seminar, conference in home and abroad. Along with those, I have to do administrative duties basically file works too. So, I have to communicate those national and international organizing bodies. Research works for Open and Distance Learning evaluation and eLearning possibilities and prospective in Bangladesh are other areas in which I like to participate and I write reports for those research studies. So research works are additional jobs I usually do. Previously, I was a Faculty of NIIT, an Indian IT education academy NIIT. I taught computer programming and networking for more than 4 years. As a Faculty of NIIT, I held different positions which were Senior Faculty, Group Leader Systems and Centre Head. Conducting classes on Computer programming language, Computer Networking as well as Communicative and Business English. Looking after Software Implementation in the Network. Making Monthly Business and Marketing Plan. Administrating CD Based Training using Simulation Software. Maintaining Crux(Customized Software of NIITI worked for computer programming. Administering MS SQL 6.5 Database. Simultanously, I also taught English secondary and higher secondary level for 4 years.I worked for both government and private organizations and played different roles. 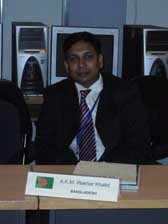 I am trying to integrate all my expertize and aim primarily to serve the people of Bangladesh. I also work after office at home for developing eLearning Contents for training from existing training materials of Bangladesh Open University. I did BA(Hons) in English and MA in English from Rajshahi University, Bangladesh. I completed a three years IT Diploma from NIIT, Dhanmondi, Bangladesh. Simultaneously, I completed a postgraduate business administration diploma, Shorter MBA from Islamic University Chittagong, Dhaka Campus. My areas of interest are organizing training programme for transferring skill and knowledge for human resource development and developing Research Proposal and Completing the Research Work and I like to get the feel that my research projects are getting finished one after another. Someday in future, I would be able to serve the people of the country more efficiently as I hope to have a chance to work at the policy making body for one public institution. This page was last modified on 18 August 2016, at 03:57.